Rock's original CTX, on paper, was a feast of high-end mobile technology: an Nvidia GeForce Go 7900 GTX with 512MB of on-board RAM twinned with a Core Duo T2700 and a 1GB of fast DDR2. It quickly found a place at the heart of the mobile gaming community - it was the machine the 2006 UK Pro Evolution Championships was played on - which lapped up its mix of power and graphical elegance. Just think, then, how a Core 2 Duo will push the CTX Pro up an extra gear. But first, let's see what remains from the original CTX. Telling the Pro from the T7600 at first sight is a hard task. The CTX Pro still looks brash and bulky. Although the polished aluminium lid is slim and ruggedly built, the boxy hull and front-mounted media buttons - there are quick-launch controls, LED battery and data info, and media buttons - create an air of tackiness. Once open, the CTX offers a comfortable keyboard area, but this too is let down by the ugly silver finish and front-mounted digital display. The keyboard is well spaced and comfortable, and two neat speakers sit alongside the keyboard and are surprisingly good quality, producing rich bass tones and clear mid tones. In terms of connectivity, the CTX Pro adds a few extras that were absent from the T7600. Gigabit Ethernet, DVI output, four USB 2.0 ports, a mini FireWire, SD memory card reader, serial connection and PCI slot remain, as does WLAN and Bluetooth. The added whistle comes in the form of a 1.3-megapixel webcam centralised inside the open lid. 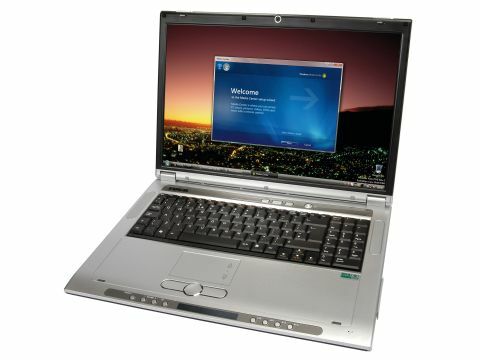 Previous criticism of the T7600 CTX centered on all of its ports sitting at the back of the unit, making mouse and other peripheral connections cumbersome. Two of the USB ports now run down the side of the CTX, though we would have liked to have seen these as extra ports rather than just a shifting of position. Both the original Xtreme CTX and the CTX Pro utilise the same 100GB hard disk spinning at 72,000rpm. What's more, each fires on the same 667MHz DDR2 RAM at the same clockspeed, meaning comparative benchmarking shows the added performance factor Core 2 Duo brings to the party. The Pro outshone last year's CTX by around 25 per cent, notching up a 3DMark 2006 score of 5,218. In terms of gaming, the CTX Pro again fared significantly better than its predecessor. The same Nvidia GeForce Go 7900 GTX with 512MB is present - a great card that Rock should be commended for employing with such a beefy amount of onboard RAM - so comparisons again show the added power of the Core 2 Duo. Results weren't as clear cut as in general processing, but did average five to 10 frames per second quicker than the Core Duo model. Frames are smooth and clear in games, while in video playback, the CTX Pro is as pristine as any desktop and monitor combination. Of course, the downside of such raw power is a slight battery life and, again, like its predecessor, the CTX Pro ran out of gas one hour and 22 minutes into a DVD. The screen is again the same as the previous models - a 1680 x 1050 native display that's bright and crisp, and more than capable of wringing the best from the 7900 GTX. Colour reproduction and matching through Nvidia's pre-loaded software is responsive and easy to use, and video playback and shadowing is outstanding. An optional extra is the X-Glass display that promises to improve colour-matching and widen the viewing angle to 1920 x 1200. As a 17in laptop, the CTX weighs in at 4.25kg - a considerable bulk for a portable. This, twinned with the added weight of the power supply, means the CTX isn't the most moveable of laptops. Yet when you consider the 100GB hard disk inside, together with dual-layer DVD writer, you can understand why: this makes no compromise to practicality, and Rock has again focused on producing the most powerful and responsive gaming machine it can. There's no doubt that incorporating a massively improved new architecture from Intel has paid dividends in terms of speed. The Core 2 Duo in the CTX Pro is fast, and makes it a very powerful laptop, perfect for gamers or anyone who requires the power of a desktop in a semi-portable unit.